I'm pleased that two of my recipes has won the Healthy Recipes Contest organized by Health Exchange Singapore!. 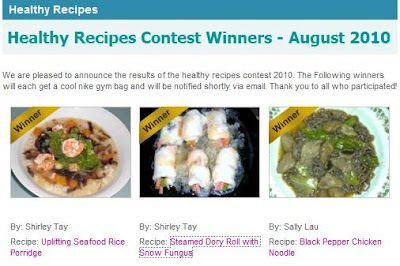 Check out the other winning entry: Losing Appetite? Try This Uplifting Recipe! Eating fish can provide an excellent source of Omega-3 fatty acids, vitamins & minerals that benefit your general health. It is recommended to have at least two servings of fish per week to help prevent heart disease, lower blood pressure & reduce the risk of heart attacks & strokes. Snow Fungus (雪耳) - lubricate lungs; produce & nourish fluids. Traditionally, Snow Fungus has been classified as one of the precious emperor dishes. These stunning lucent flowers sit prettily on the serving plate with the tender fish rolls, enhanced by the tangy taste arising from the ham & mushroom. 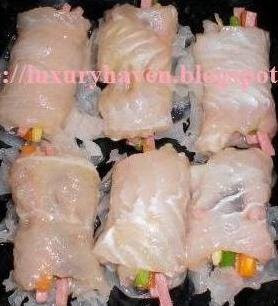 Marinade fish with wine, oil, corn flour, salt & pepper & set aside. Soak fungus till soft. Drain water & remove “base”. Cut into half & put the 6 pieces onto a plate. 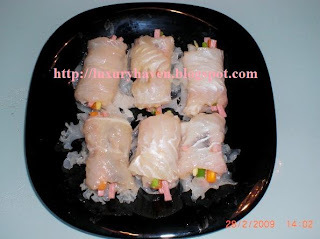 Cut spring onion, ginger, carrots, mushroom & ham into stripes of same length & place them on the seafood. 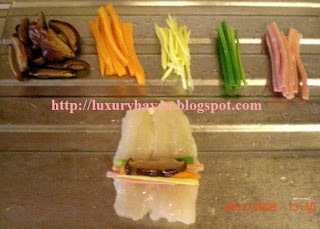 Roll the fish neatly & place them individually onto the fungus. Steam for about 2-3 minutes. Do not cook the fish for too long or it’ll harden. Remove & pour the liquid from the plate onto the wok/pan. Add ½ tsp oyster sauce, drop of wine, sesame oil & pinch of pepper. When liquid boils, mix a pinch of corn flour with 1 tbs of water & stir in to make sauce. Dribble sauce onto fish & serve your flowery seafood hot.